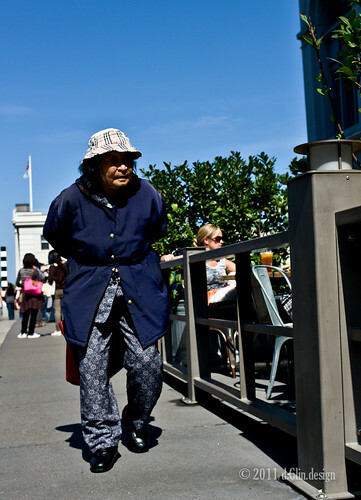 Who said the Leica M9 can only do street photography? I have been the resident photography for the wife’s Cake/Cookie hobby. 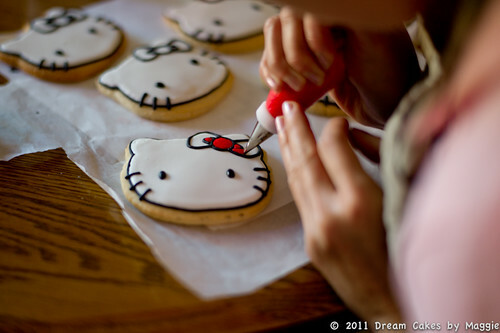 If you’re into cute and amazing cakes and cookies, check out her blog, flickr, or facebook. Most of the photos you see on her site were shot by me. Product photography was simple back in the Canon days. Slap on the Canon 100mm 2.8L Macro on the body. Set it on tripod. Wired it up for remote shutter release. The only thing I had to worry about was the light and product placement. The camera did everything. Well almost everything. I usually set it up in full manual or Aperture Priority. Since it’s in an control environment, I knew the settings. Tip #1: Product photography shooting workflow. Get a Remote shutter release or use the 2s timed release that’s build into most cameras. 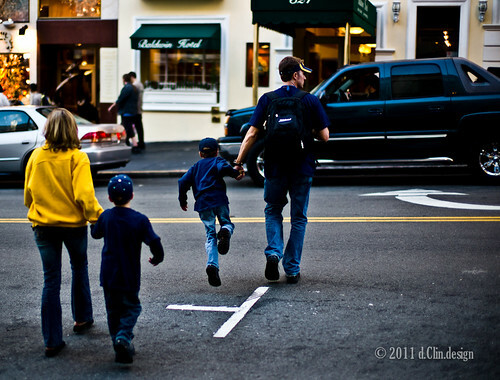 Set your camera at Aperture Priority mode. focus 1/3 into the product. This will make sure your entire product is within focus. Take note of the shutter speed reading. Make adjustments as needed base on your lighting condition. Product placement, compose, then Shoot!! Most everyone including myself started product photography by buying lots and lots of lights. You can never have enough light to light the product. Then you need the soft boxes, the light tents, etc. Mainly, that’s how the professionals did it. You want consistency on the product shots. But one major side effect of the resulting shots as best put by my wife. The picture looks sterile. There is no soul. It’s a clean picture, but just blah. You can probably see some of the examples on some of the earlier shots in her Flickr and blog. Most of them were done with the Canon 5DMKII or Canon 1D MKIV w/ 100mm 2.8L combo fully lit. As I started to shoot her cakes and cookies with the Leica, I notice one thing. Tip # 2: Let the available light for for you and NOT you work for the light. Essentially what this means is use your camera’s setting with the tripod to make the best of available light. Remember the take note of the shutter speed reading in tip #1? Since you’re on a tripod, you can let in a much light or as little light as you want into the camera by adjusting your shutter speed. Let the camera do an initial reading for you then if you need a brighter shot, slow down the shutter speed or if you need a darker shot, raise the shutter speed. One important note, make sure the camera is on a steady ground and when you release the shutter, it’s not introducing any shake, or else, it will be a blurry picture for the most part. 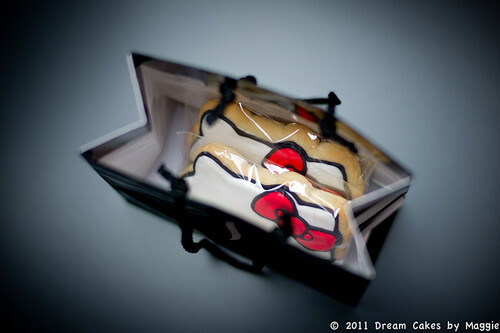 By shooting it this way, now you can see the details of the product, in my case, Cakes and cookie. The shadows are just important as the highlights. Before, I would light the entire area to get rid of shadow. Now, I embrace the shadows!! By all means, I’m just beginning to try out this new method and slowly putting all my light away. 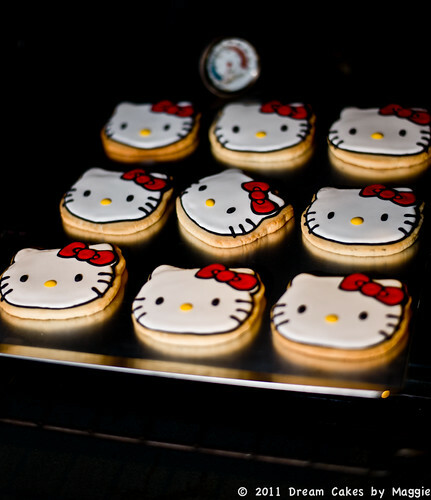 The Hello Kitty cookie set you see on this page was done with natural window light or 1 CFL in a soft box rather than my previous setup with lights on all three sides with one on top. Definitely keep an eye on her blog as I will be shooting a lot more of her delicious treats!! Whoa it’s early. But if you want that glorious morning light, you have to get up early. Thank god it’s fall now and sun rise isn’t as early as it was a few weeks ago. Nonetheless, hitting the snooze button was a bad idea. I had the alarm set at 4:45am. 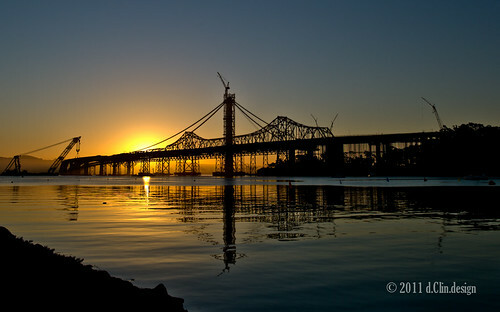 Hoping to give myself enough time to get out of bed and head over to Treasure Island by the meeting time at 6:30am. When I finally drag myself out of bed, it was already 5:45am. As I drove, I notice the day was getting brighter and brighter. One thing for sure besides death and taxes, the rising sun don’t wait for any photographer. I pull into the parking lot at 6:40am as day was getting really bright. Luckily I already caught a few good skyline shots the night before so I focus my time across the street toward the construction. It’s also the side that the sun started to peek out behind the bridge. I still had the 24mm Summilux on from last night. It worked great for capturing the entire scene. Not all the attendee made it out. I don’t blame them. I’m usually not an early bird myself either. But I figure not too many weekends I get the free pass from the wife to go out and shoot, I need to take advantage of it. After arriving back at Hotel Triton around 9:30, down 2 cups of coffee and settle in to start downloading pictures from last night as well as pictures from this morning. I was eager to see how the night picture as well as the sun rise picture came out. From first glance, they looked useable. One thing I learn from using the M9. The camera LCD screen leaves alot to desire. But it also forces you to work on your shot before you press the shutter button. Contrary to common belief, I actually have a lot more keepers with the Leica than when I was shooting with the Canon. I think part of it is the discipline of see the shot you want before you shoot rather than shoot then see what you get on the screen. I believe Kim quoted Ansel Adam with something similar during his Friday Keynote. A group of us started to headout a little earlier to the next shooting destination. One person I kept on forgeting to mention is Tyler Gee. He’s the sales rep from Fireside Camera off Chestnut St. To be honest, before today, the only place in the Bay Area I would think of that carries Leica is Keeble and Shuchat in Palo Alto and Camera West in Walnut Creek. But after chatting and hanging out with Tyler over the weekend not to mention all the praises from Tom, Tyler from Fireside Camera definitely gets my vote for Leica gear from now on. Anyways, we started to walk through China town with Tyler and Will to capture some images before the meet up. One of the attendee forgot to bring her memory card. Being always prepared, I loan her my spare card. Tyler seems like a local in China Town. Showing all the alley ways and great photo ops as we walked around. There was a ping pong tournament in couple of the street which turned into excellent photo op. I snap a few shots that I was please with. Today, my goal was the shoot with the 0.95 Noctilux wide open. This present a challenge on it’s own since at f/0.95, there is a lot a lot of light hitting the sensor. At some point, I had to use the pull iso80 to even get proper exposure at 1/4000th. This leaves me only to be able to shoot in the shade. A few more shots later, I got a flash card full message. I forgot to format my card before I headed out this morning. Since I loan out my spare card, I had two choices. Start deleting some of the previous pictures that I already downloaded or just format the card and give up the 10 shots of China Town that I already took. Knowing there is potential memory card issue with deleting and I didn’t want to run the risk to loose the rest of the picture that I will be taking, I choose the later. Bit the bullet and formated the card. Tip #1: As simple as it sounds. Make sure you download the pictures off the card before a schedule photoshoot and ALWAYS format the card in the camera before you leave for the shoot. You will always have a fresh card with full capacity to shoot. And, Always carry some extra cards. As we continue to walk through alleys of China Town, we came upon a group of kids getting ready to do the lion dance. Shortly after, we met up with the rest of the group at Cafe Trieste. 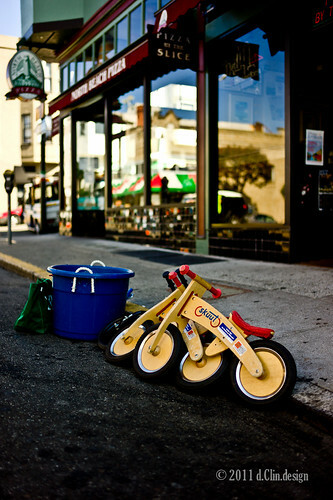 If any of you ever go to North Beach, make sure you stop by this Cafe. One of the guys there making coffee is also a Leica shooter. Not to mention, they have excellent scones and cappuccino. The ambience was also perfect for the Noctilux!! The rest of the morning was to walk around North Beach and meet around Washington Park. When we all met at Washington Park, Tom B. gave us an assignment. Try to get a picture of a couple kissing. 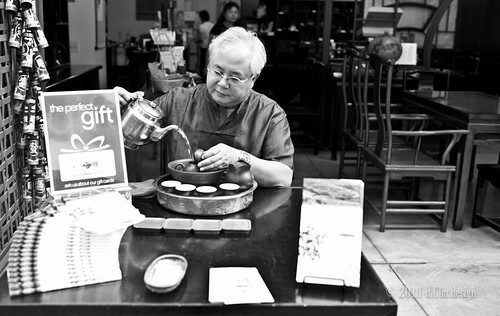 you can capture the decisive moment or make your own decisive moment. I first follow around with Tom B. He walked up to a family that was sitting at the park. Introduced himself and told the family that he’s an instructor for Leica Akademie. Handed them his card and told them about the assignment and nicely asked the mom and dad to kiss while we photograph them. The family giggle and complied to his demand. I just learned street photography 101. One of the attendee hit up a 2nd couple and once again, the giggle and complied. It seems simple enough so I figure I try my luck at the 3rd couple that we saw sitting at the bench. I did notice they didn’t seem like they were enjoying each other’s company but it was a good looking couple. So I approached them and ask them if they mind if we snap some photos of them for the photography class? The guy guy declined, but he was nice about it. No worries, at least now I feel empowered to try out my new found skill next time. The group split up as we headed back to the hotel. 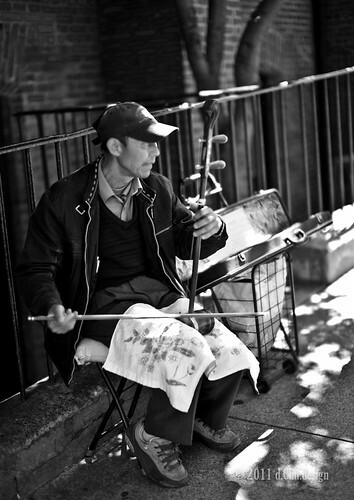 I had a chance to shadow Will and learned a few tips from him as we dodge through China Town. It was great to see how he approaches people and also mixing it up on “stealing” that shot. One question I pose to Will as a street photographer, what’s one thing that he looks for. His answer? Tip #2: Contrast. But contrast in the sense not only color, or black and white. But contrast in people, contrast in the scene. It could be a tall person walking with a short person. Or an old man walking with a young lady. These are the things that will draw people to your photo. It’s also how you can tell a story with your picture. 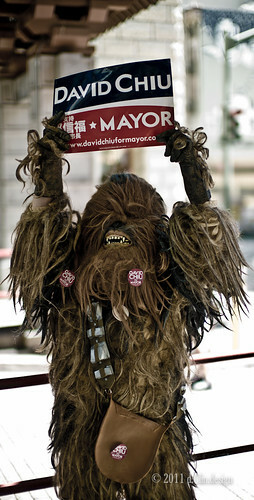 On the way back, we met Chiu-Bacca in the middle of China Town…. After eating lunch once again at the downstair cafe provided by Leica, (The food there was excellent by the way. Get the Chicken Club!! I had the burger on Saturday, it was only so-so. The fries was good though.) we headed back up stairs for our final editing session. This time both Tom came around as well as Will to help us sort through and critique our photos as well as giving us suggestion on basic edits. The last speaker was Tom B. He show us a selection from his personal collection as well as share some sneak preview of what Leica Akademie has plan for the next upcoming year. There were some amazing shots!! What’s even more amazing is some of them were’t taken with the M9, or the legendary S2. But rather with a DLux2!! The final sound bite I want to leave with my weekend experience. If you carry your camera with you all the time, you wouldn’t have to go out and Shoot!! Lastly, The final project was to select 4 picture for a slide show as well as pick one picture that you want critique on. This was my shot for critique. Feel free to leave comments to let me know what’s good and what I can work on!! When it was time to check back in the loaner equipment, I didn’t really want to give back the Noctilux nor the 35mm Summilux. Knowing that now I have a line with Tyler, I placed my order. Hopefully I’ll see it one or the other soon!! And of course not both at the same time… I don’t think my wallet nor the wifey will appreciate that!! All in all, if anyone has the chance to attend one of these Leica Akademie weekend workshops, by all means sign up!! It’s worthwhile. Even if it’s just the one day course, it’s still very worthwhile!! I know I will be applying everyting I learned this weekend on my future photographs. They will be announcing the new schedule sometime in October. I can’t wait to sign up for the next event!! While waiting for the wife, I walked around Grant and Bush. 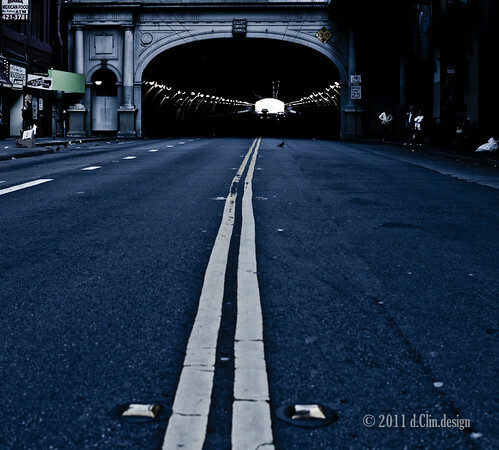 I figure it’s where the China Town gate is, there is got to be some interesting things to photograph. As I walk up Bush toward Grant, I notice something on the light pole. I thought I was seeing things. As I move closer, it disappears. As I move farther, it show up again. Looks like someone made a Koi out of wires hanging on the pole. The sun was perfectly hidden behind the tree to cast enough light just to show the fish. One thing I forgot to mention earlier. They got a 2nd shipment of equipment in. The original shipment of loaner equipment was stuck in customs so Leica ended up shipping another set out in time for the Friday kick off. The 2nd shipment finally cleared customs and made it on Saturday. This also means there is more lens!! According to the Leica guys, Leica supplied over $200k worth of equipment for the workshop. This also means there might be another 0.95 Noct. I chased down one of the Tom as soon as the package arrived and snatched up the 0.95 Noct. I actually had a chance to spend a few hours with my friend Joe’s copy a few month ago. But I wouldn’t give up any opportunity to play with this lens. Once again, I had over $30k of Leica gear, not including my computer bag on me. 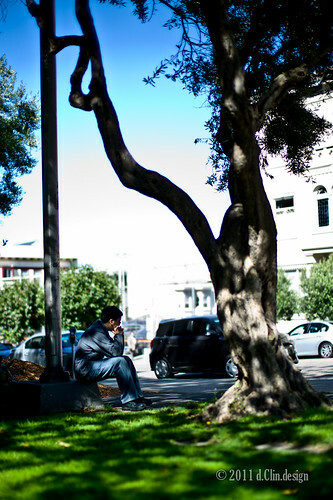 This time, wondering around downtown SF. Also holding the M9-P with the 0.95 Noct. I had to keep my eye wide open. After the wife picked me up, it was heading to the grandparents to pick up the kids. They live in the east bay so we crossed the bay bridge. On the way back, I notice how clear the sky was. 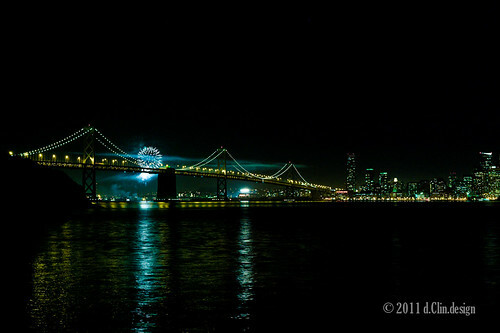 It’s typically hit or miss with the fog and smog whenever you try to shoot the SF cityscape. 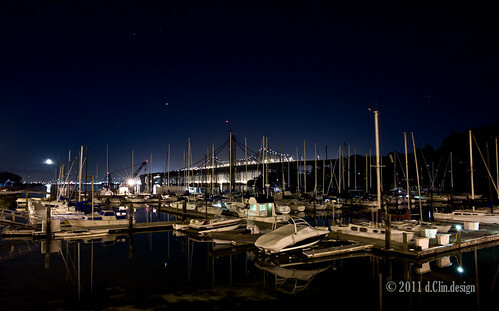 Knowing that the next day’s agenda was a 6:30am photo session at Treasure Island, I wanted to try the nightscape and scope out the scene first. Once again, a very understanding wife, dropped me off at my car still in the city and let me do some more shooting. 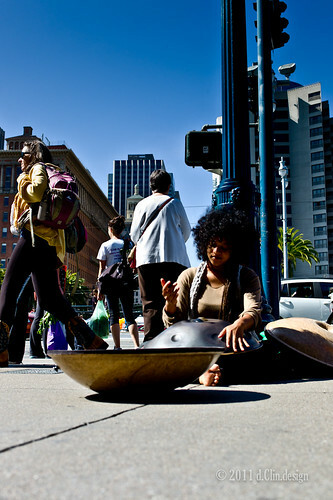 I first walked around Union Square to see if I can capture something spectacular with the Noctilux. It proved to be more challenging then I thought. 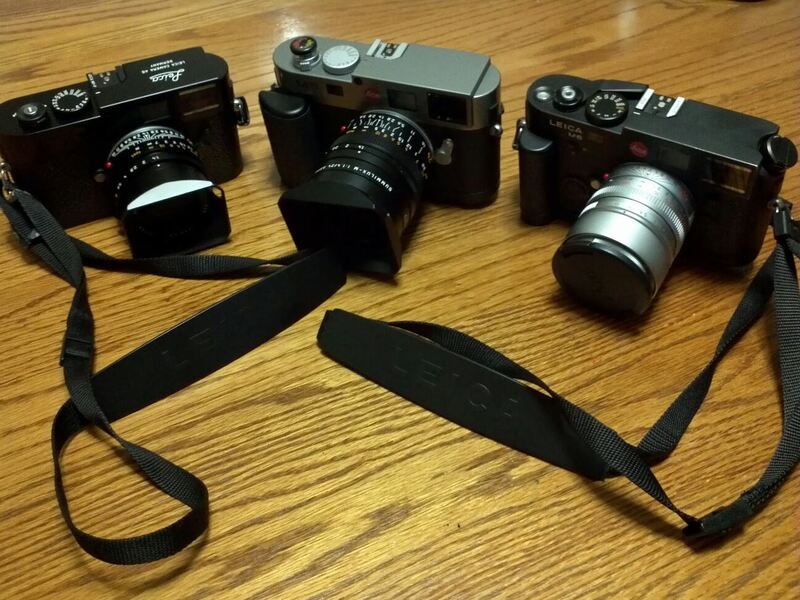 Not to mention I didn’t really want to get mugged with all these Leica stuff on me. I was able to capture at least one interesting shot. It was dark now. I figure it was a good time to head over to treasure island. As soon as I got there, I notice the parking lot was packed. Lots of people with tripods and cameras as well as tour buses. It was an awesome view. Shortly after I found parking, I heard fireworks going off near AT&T Park. Quickly grab my tripod, found a spot and setup. I went with an exposure that I’m familiar with for night shots and started snapping away. I still had the 50mm lens on. 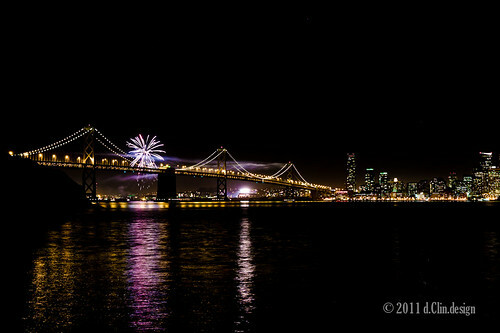 I figure if go through the process of changing the lens and tweaking the settings, I would miss the fireworks show. I just compose it for the 50mm and fired away. After the fireworks, I swap the lens to the 24mm Summilux ASPH. I haven’t had a chance to play with this lens yet. This range would be perfect for capturing the entire cityscape. 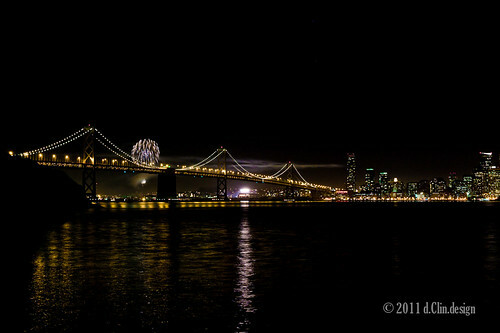 I also wanted to capture part of the construction of the east bound side of the Bay Bridge. 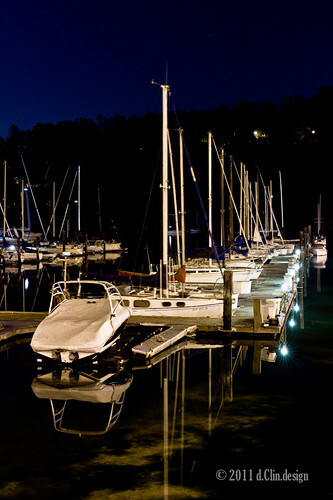 I turned around and notice the moon was extremely bright that night which was casting a very nice light over the yacht dock. Amazingly, the water was also extremely calm. Creating a mirror like effect for the reflection of the boats. 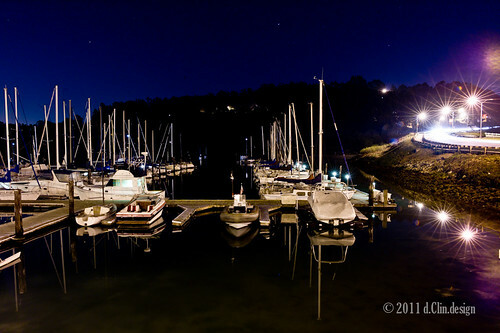 Tip #1: To get star shape out of the camera from the lights, use a smaller aperture. In these few pictures, I used f/8 with at least 16 second exposure. This will depend on your lighting condition as well as the environment. The amount of spikes coming out of the lights depends on how many aperture blade. The 24mm f/1.4 Summilux I was using had 11 blades!! All in all, it was a very worthwhile side trip. One last tip for night shots. To get steady night shots with long exposure with the M9/M8 especially if you don’t have a remote shutter release, use one of the build in functions. You can set the shutter release to 2 seconds in the menu. Then set the mode on the camera to timed release. (It’s the on/off switch. Just turn it all the way to the left if you’re holding the camera lens facing out.) This way, every time you hit the shutter button, it will delay the release for 2 seconds. Plenty of time to get your hands off the camera and step back to prevent any camera shakes while the camera is doing long exposures. Do remember, Leica does apply Noise Reduction for long exposures that’s longer than 1 second. ie. You will see a message on the LCD that reads Noise Reduction 5s right after you take the 5 second exposure. The camera is taking a picture without opening the shutter and then merging the expose and non-expose picture together. This will help eliminate any of the potential hot pixels created by the camera sensor heating up during long exposures. 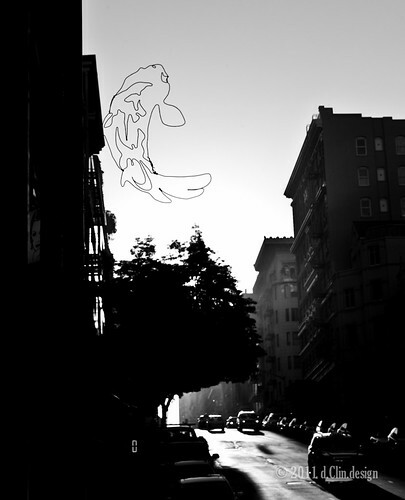 That was the starting time for Day 2 of Leica Akademie’s San Francisco Weekend. Knowing that we will be doing lots of shooting today, I wanted to travel a little lighter. Since I borrowed an M9-P, I figure I didn’t need to carry 2 body. I packed my bag with all the borrowed gear M9-P, 35mm Lux, and 24mm Lux. I wanted to challenge myself on using a range that I’m usually not comfortable with. I love the 50mm range. It gives me the comfort of standing just far enough away to capture the moment and not being in someone else’s face. Shooting all day with the 35mm or the 24mm will get me to step 2-3 step closer to the subject. So I left the 50mm at home. Not to mention, since I only have limited time with these borrow lenses, might as well get a good run with them. I also packed up my Macbook Pro 15inch loaded with Lightroom ready for the editing session this afternoon. I got to the parking lot early. I figure I had some time to kill so I went around shooting again. I have to admit, It was a pain carrying a laptop bag and a camera bag with a camera in my hand. I should be glad that the Leica system was a lot smaller and lighter than my Canon setup. 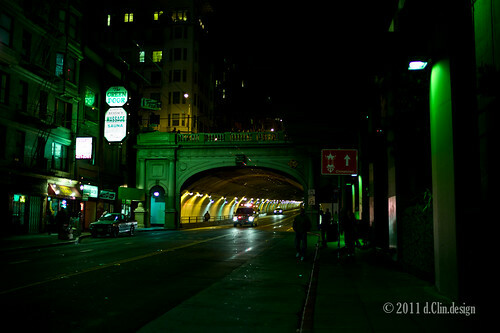 I decided to shoot the same tunnel under a different light. It was shady but enough light to cast a blueish hue on the street. This was as good contrast to the neon green light from last night. After snapping a couple pictures, I figure it was time to get up to the classroom to load up on caffeine. It is always tough to wake up this early on Saturday!! On the way up, I bumped into Tom Brichta. He saw me snapping away before class. Well, this morning’s agenda was simple. 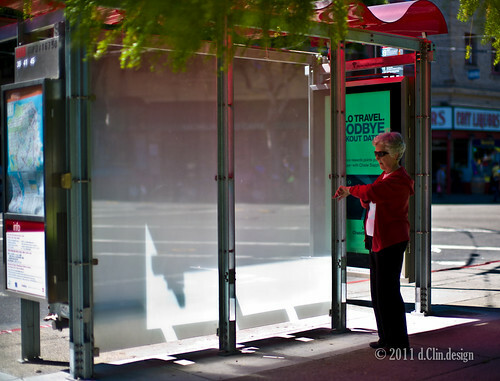 We will get shuttle to the Ferry building and start snapping away at street photos. There was a farmers market going on and a lot of tourist with cameras, so it should be a good place to get comfortable shooting street. As we gather into the shuttle, Tom B. spoke a little about exposure and focusing. Also spoke about dividing group up based on what you want to focus on. As soon as we arrived at the Ferry building. Everyone was itching to start snapping. The 2 Toms did manage to get a group of folks to gather around to demonstrate some strategy on getting the proper exposure. 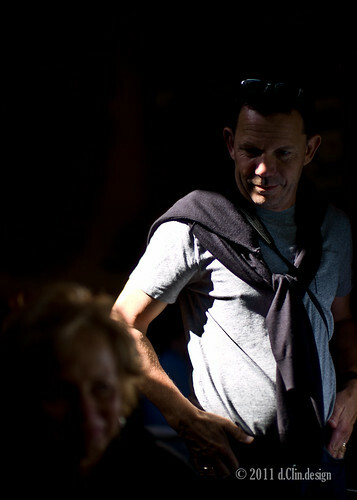 Tip #1: Manual exposure metering for high contrast lighting scene. Since M9 does center weighted metering, it might not be feasible to always count on the camera properly setting your exposure in Aperture Priority mode (A mode on the top dial). 1. Pick your f/stop (Turn the ring on the front of the lens to your favorite aperture. You can start with f/8 on a bright sunny day. Go up or down depending on the effect you’re looking for. 2. Turn the shutter speed dial to the red A. 3. Look through the view finder and point the center on the viewfinder on the ground at a shady spot. Take note of the number. It was 1/750th of a second for me on that day. 4. Now, point the center of the viewfinder on the ground at a sunny spot. Take note of the number. It was 1/1500th of a second for me. Now you have two exposure reading for the light and dark. Depending on what you’re trying to shoot and the look you’re looking for there is a few things you could do. You can now turn the shutter speed knob to 750 when you’re shooting in the shade and turn the shutter speed to 1500 when you’re in the sun. If you’re shooting a scene that’s part sunny and part shady, you can pick a shutter speed anywhere in between 750 – 1500 depending on if you want the sunny side blown out or the shady side shadow out. This is usually a good guideline to get you started. Tip #2: Red “A” is your friend. 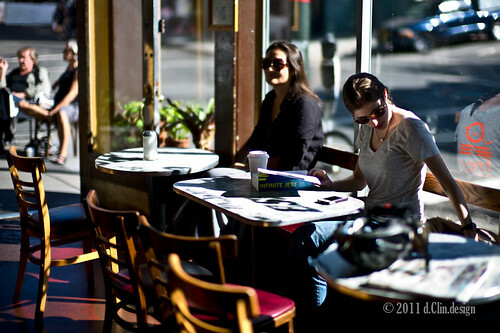 Usually when I shoot street photos, I’m walking in and out of sunny and shade area looking for that decisive moment. I don’t have time to turn the shutter speed dial. 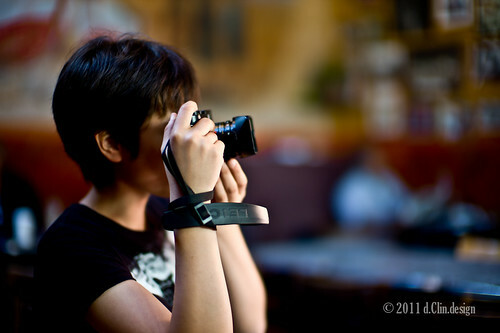 I use the aperture priority mode and trust the camera. You can easily set your camera up to use the wheel to change your exposure +-1/3 of a stop all the way up to +-4 stop. Before I walk into a scene, I would still meter the ground for both sunny and shady spots to get an idea of the latitude that I will be working with. Then leave it on red “A” mode. As I walk into a building where it’s mostly shade, I would hold the shutter button half way and turn the wheel 4 clicks clockwise. This would give me +1 1/3 stop. As I shoot I just decrease the stop if the pictures are overblown. I do the opposite when I’m in the sunny area. Hold the shutter button half way and turn the wheel 4 clock counter-clockwise. Turning the wheel while the camera is at eye level is a lot easier than trying to turn the shutter speed knob at the top. Make sure you set your camera in the menu option to be able to adjust the exposure compensation. 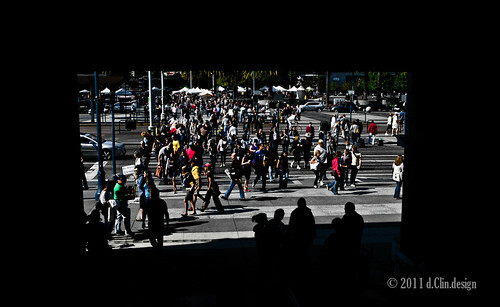 First thing I notice when I got to the Ferry building was how busy it was. 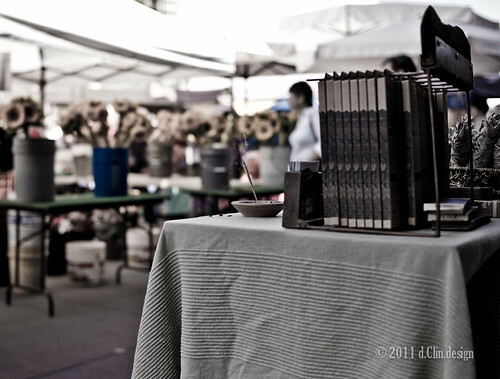 Being a native Bay Area resident for over 20 years, I been to enough farmers market. Just never really thought it was an interesting place to shoot pictures. 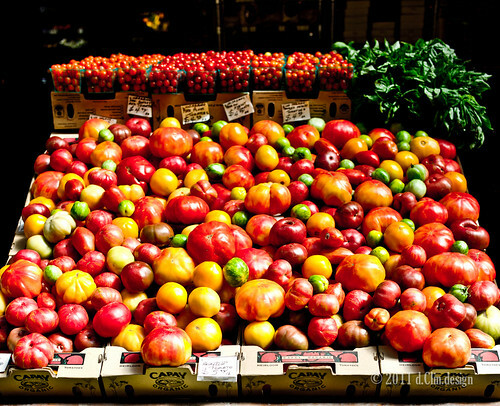 There are a lot of very colorful fruit, vegetable, and flower stands. But the theme of this round of shooting was to photograph people. There were plenty of people, just not too many of them are that interesting or doing interesting things. There are of course the street performers, but I’m sure everyone will have plenty of picture of them. As I started walking around getting ready to snap some shots. A gentleman stopped me. He didn’t look like one of the attendee of the Akademie. I thought to myself. Great, I haven’t even started and I already got caught. First thing out of his mouth was, “is that a M9-P?” Then he withdrew from his coat pocket a silver M9. We chatted about Leica and the market for ~10 minutes. As I learn the next day, this would have been a great opportunity to capture a shot. He did look a little like Donald Sutherland. Imaging a shot of him holding his M9… Priceless. I was not decisive enough to capture that moment. As I walked around getting comfortable with the surrounding, trying to get into the Photogrpher Trance (As best put by Kim Komenich describing Cartier-Bresson’s shooting style), I just felt no inspiration. Snap some here, snap some there. Nothing was interesting. I did see some interesting moments, but by the time I try to capture it, it passed. The other problem I had was I just could not get close enough to the subject. I still had the fear of looking too creepy while shooting a family having lunch with their toddler daughter as I approach them. I was using the 35mm lens which is not my usual range. I’m usually more comfortable shooting with the 50mm. This weekend was about me breaking out of my mold!! While scanning the scene, I had Kim’s lecture about composition flowing through my head. 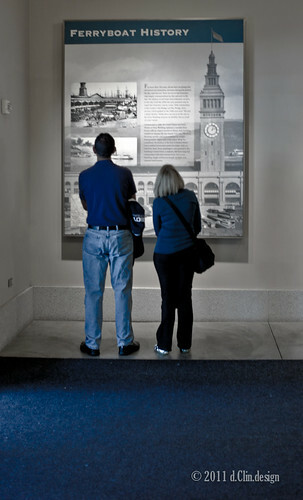 Looking for patterns, contrast, the decisive moment. Maybe I was looking for too many things and not really seeing what’s in front of me. I decided to walk away from the bustling crowd to see if I can catch something more interesting. I walked towards the bay bridge towards this big rocket sculpture. Then something caught my eye. 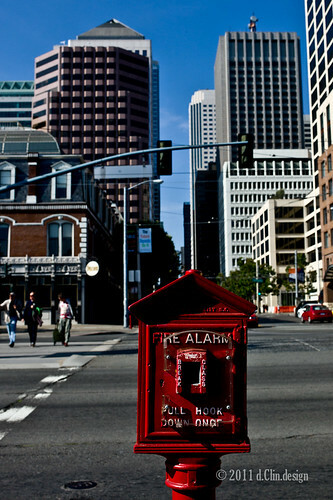 A bright red Fire Alarm in the middle of the street. It seems to line up to everything. Contrast to the street, patterns with the building, the decisive moment of the red car in the background, the foreground, mid ground, background. As I compose the shot, I was getting into it. I started to see more things. It’s no longer a bunch of people or bunch of fruit stand. I was starting to pick out objects. As lunch time roll around. Everyone gather back at the shuttle and headed back to the hotel. The Akademie provided lunch at the cafe downstairs. This was also a great chance to debrief as well as getting to know some of the other attendees. After lunch, we all headed back up to the room for some editing tips. What came out of Tom S.’ mouth was surprising to me. I though it was going to be a session on some Leica secret sauce that you can apply towards the M9 in Lightroom. Instead, he spoke about the basics. But it was the fundamental thing that every photographer should apply. I’m guilty of not adhering to a big part of it. It was a session on workflow. What’s the best way to setup your workflow to get the images safely into Lightroom and sorting them. Tip#3: Back up, Back up, and Back Up. Make sure you always have 3 backup of your images. If you’re serious about your photography, this is the fundamental. It doesn’t matter how good your images are or how good you’re at capturing images. If you don’t have backups, once it’s gone, it’s gone. Have a working external Hard drive that you edit with on the field. Have that backed up to a 2nd external Hard drive after you copy the images in. It’s also good to back up your Lightroom catalogue as well since all the editing you do in Lightroom is metadata. It doesn’t affect the actual image (The digital negatives) Once you’re done shooting and importing the image in, make sure you back that up to your central backup at home. It doesn’t hurt to also have a monthly backup drive that you place at a different location or use some online storage as a backup for your winning images. I rather like Tom S.’ method of sorting. He would view the thumbnail and quickly flag the ones he think it looks good in thumnail size. His rule of thumb was that if it doesn’t look good small, it’ll look even worst large. This tip allow me to quickly sort through the images and flag the images that I would be interested in going back to look closely. I always had a tendency to take too long on the initial flagging since I like to look at each images closer. His follow on tip is to use the star system. Go back through the flagged pictures and put 1 star on pictures that you would want to touch up. This time around, you will be looking closer at the picture. Checking the exposure and focus as well as composition. Since his assignment to us was to share the image as it’s coming straight out of the camera, so the instructors can help and critique on the photographic skills rather than touch-up skills. This becomes very challenging as your mark your pictures. Our goal was to select one picture that will be projected up on the screen so we can get critique by the instructors and the class. Through out our filtering process, both Tom, Kim, and Will (I will speak more about Will in a bit) were there to help us select. From being a hobbyist, amateur, semi-pro photographer, it was quite exciting for my photos to be reviewed by a Pulizter prize photographer. Once we finish selecting, the next guest speaker William Palank started setting up his presentation. I remember briefly reading about Will from some of Leica’s website. He has taken some amazing ethnic diversify photo. 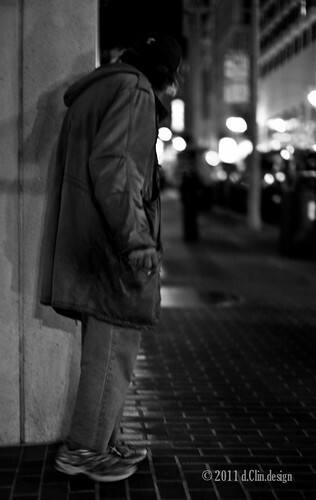 His focus is mainly on Travel photography as well as street photography. He has been featured by Leica numerous times. As part of his presentation, he shared his experience while traveling and photographing as well as some behind the scene of how he captured his photos. All in all, it was very refreshing and eye opening. The last thing for the day was to review the 1 photo each of what we took during the day. Kim was the lead and provided great feedback on all the images. It was great to learn by seeing other people’s work and how to improve upon them. 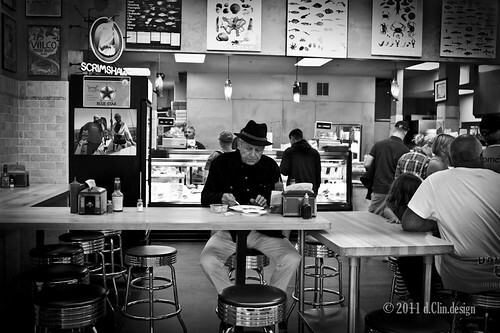 I remember walking inside the ferry building and seeing this gentleman sitting alone eating. I actually walked passed him and ended up doubling back to capture this image. It was the contrast of his shirt and hat that first caught my eye. Then it was rare to see so many empty seats in such a busy location. The lighting was perfect with the white plate acting as a reflector to light up his face from bouncing the overhead lights. This was my shot of the day. As the sessions come to an end, I decided to hang around to take some more picture while waiting for the wife to pick me up. Typically if you follow this blog, it’s usually a collection of pictures that gets dumped on here linked to my flickr page. The descriptions are all the same for the same set. Great visually, but not very content full filling. From this weekend’s experience, I’m now motivated to start dedicating more time on this blog to talk about my experiences as well as sharing tips as I learn them while on my way honing the artistry of becoming a “Leica Ninja”. The first time I heard the term “Leica Ninja” was from my attendance at Leica Akademie North America Weekend in San Francisco. It was a term mentioned on the first day by Tom Smith (Head honcho for US Leica Akademie I think). He was our main host for the weekend. I will be going into more details about the entire weekend in a little bit. But before that, here is a little back story on how I even end up in this class. I dove head first into the “Red Dot” craze back in April. Having been shooting Canon’s all my photography life, I felt it was time for change. The thought of carrying a big SLR with the latest Bokeh master 85mm 1.2L just doesn’t excite me anymore. I notice that the camera would sit in the camera bag month at a time. I felt my love for photography was waning. I been chronicling my experiences in The Beginning and The Flood I will be adding two more chapters in the near future. Of course talking more about my experience with Leica. I wanted to get back to the basics!! To cut the story short, back in April, few weeks after I bought my first Leica lens (Black 35mm Summicron f/2 ASPH non-6 bit), I saw the announcement for the Leica Akademie. At this point, I didn’t even own a body yet. 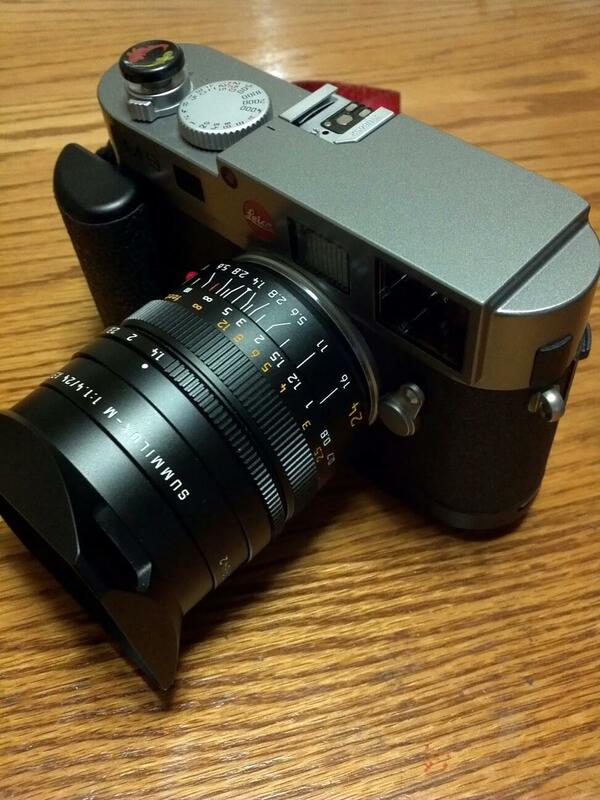 I was using a friend’s M6 to get the Leica experience. Went down to Walgreen to pick up 4 rolls of ASA400 BW film and started shooting. In short, I signed up for the class knowing that M9 will be in my future someday. As the days gets closer, the wife started to put events in the calendar. Knowing that September 16 was a weekend that I blocked out ~5 month ago, she should be able to schedule around that? Well, if it was events that she plan, YES. If it wasn’t, then of course NO. A month leading up to the weekend, we got a wedding invitation for one of her family friends getting married and wanted my kids to be the ring bearer. Knowing that I usually don’t take picture of my kids, it was easy to tell her, um.. Hon, can you go by yourself? You don’t really need me there right? I did buy you the GF2, that takes great pictures. Being a very understanding wife, she cross my name out on the calendar for that weekend. On the Monday before the weekend, one of my wife’s dearest friend’s husband passed away. Rest in Peace R. He’s been fighting cancer for the past few month. They planned the funeral on Saturday. Once again, being lucky to have such a understanding wife, she went by herself to pay respect on behalf of our family. Anyways, on to more cheerful things. Friday came. Checked the reminder email from Leica Akademie that was sent out earlier in the week. To be honest, I didn’t read the entire email. Just Hotel Triton 4pm. Packed up my gear and fought the traffic into the City. Hotel Triton is a cute little hotel on the corner of Grant and Bush. Nice central location next to Chinatown and the main shopping area. Great street shooting location with many interesting people. When I got there, I didn’t really have an idea what the experience was going to be. All I know is that I get to play with Leica gear and learn from Leica Masters. So I just went up stairs, found the room and the was greeted at the Door by a Tom. As I later found out, Tom Brichta is the Leica Sales Rep for Northern California. Luckily, Both the key hosts for the program was name Tom. I’m usually really bad with names. As the instruction started shortly, Tom mention that 4pm was for going over the basic of the M9. The actual Friday reception starts at 6pm. I assuming that’s when the bulk of the other attendee was going to arrive. I thought this would be a great time to get a refresher on the M9, maybe there are some secret features that I never knew existed. All in all, it was good to confirm everything I knew about the camera. 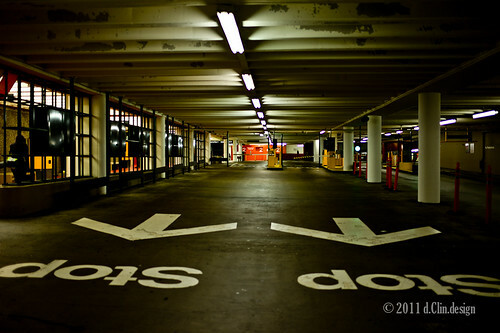 TIP #1: The actual viewable frame line on the Leica M9 is calibrated to 3 meter. As you focus closer, regardless of what you see in the view finder, the actual frame line that shows up in the photo will be 2-3 frame lines tighter. The farther you focus, the actual frame line that shows up in the photo will be 1-2 frame lines looser. So keep this in mind when you’re framing your photo. Even though now days, it’s usually fairly easy to crop a picture especially at the M9’s 18 megapixel, just make sure you capture enough of the picture so you can crop. During the review, I couldn’t keep my eye off the white table right under the projection screen. It was loaded with M9, M9-Ps as well as most of Leica’s latest lenses including the fabled 0.95 Noctilux and the S2!! I’m guessing over ~$100k of gear? After the review, we took a break to enjoy some wine and Hors d’oeuvre as the rest of the attendees started to trickle in. During the break, I got a chance to get a closer look at the loaner equipment. Due to the inaccessibility of most Leica gear, whether by availability or by wallet-wise, it was quite a sight to see. 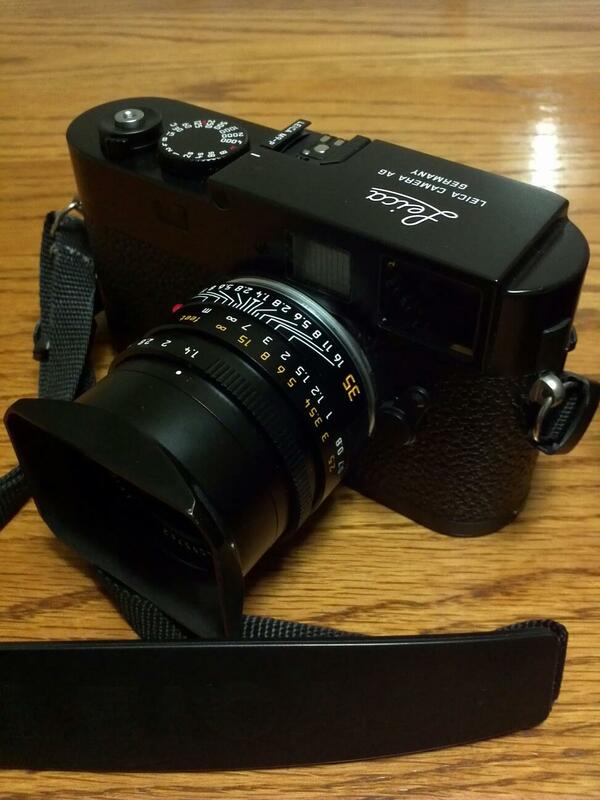 I put my name down on a M9-P Black, 35mm f/1.4 Summilux APSH, and a 24mm f/1.4 Summilux ASPH. Someone got to the 50mm f/0.95 Noctilux before I did. I been wanting to try out the new 35mm especially after reading great reviews all over the place not to mention how rare that lens is to obtain. I already own a latest version of Silver 35mm f/2 Summicron ASPH 6 bit (Arguably one of the sharpest 35mm lens Leica ever) I wanted to get a good comparison to see how good is really good. The 24mm has always been my landscape go to range. I have the 24mm f/2.8 Elmarit ASPH. Once again, trying to justify to myself if additional $4k is worth the extra 2 stops. I will be doing a little write up on the lenses I use this weekend in another post. More of my personal subjective review rather than quantitative. On to the lecture. Tom saved one part of the review for the entire attendee to see. The HyperFocal and Scale Focasing. These are couple techniques I been practicing ever since I got the Leica. Chad (from my autobio) was the one that introduce it to me earlier this year. I read all about it and try to understand all the mumble jumbo. My tip? Set it and go try it. Once you see the picture, you will believe it. 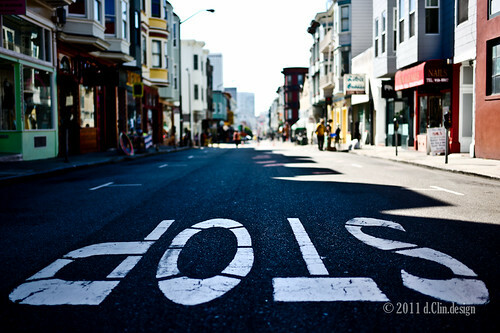 Tip #2: Setting HyperFocal. Grab your lens. Put it on f/16. Locate the two “16” marks on the lens barrel. Line the ∞ on the right “16”. Read the number on the left “16”. On a 35mm f/2 Summicron it shows 4 feet. So this means any picture taken from 4 feet to infinity will be in focus. If you adjust the f/stop to f/8, match the ∞ to right “8” and read the distance on the left “8”. Should be ~7 feet. This only works on the larger f/stop since it gives you a wider range. As you get comfortable with the range, you can try to open up the lens more to f/5.6. Keeping in mind that you will get shorter and shorter distance and the minimum focus distance will get farther. Remember, this is dependent on your lens selection. Tip #3: Setting the Scale Focusing: Instead of setting the ∞, you pick a range you want. The most you want in focus at f/5.6 is 8 feet. Put “8” to match up to the right “5.6”. Then read the left “5.6”, should be a little under 4 feet. So this means anywhere from 5 feet to 8 feet will be in focus. Everything else will be blur out. 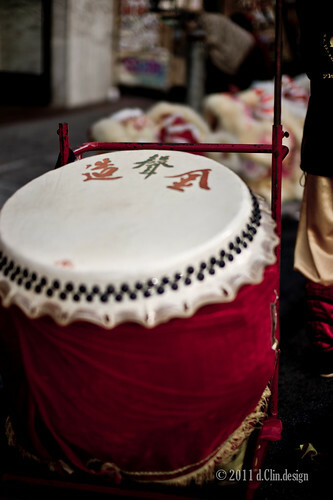 Tip #4: Use HyperFocal and Scale Focusing during the day to capture those moments without worrying about focusing. By setting the HyperFocal or Scale Focusing range, everything within that range to infinity will be in focus. One less ring you have to worry about when you’re street shooting to capture that shot. Just make sure you’re exposure are set and literally, just point and shoot!! The night ended with Keynote speaker, The Pulitzer Prize photographer Kim Komenich. I especially like his presentation on key composition techniques used by famous photographers. Sadly to say, the only one that he mention that I actually knew who it was was Henri Cartier-Bresson. As I venture more into the artistry of Photography, I need to brush up my cultural knowledge and study more works from legendary Leica Masters. All in all, the keynote was very inspirational. That was the end of Day 1!! On the way to the parking lot, I couldn’t wait to try out the 35mm lux even though I have around with over $30k worth of Leica gear on me. I snap a couple shots before calling it a night.